I bought this book from Audible and listened to it using the Audible app on my iPhone. This is the 4th book in the Retrieval Artist series. Jay Snyder turns in another great performance; to bad the story is not up to snuff. This story took the politics to far, I seriously lost interest in this story many times. I feel like there is very little action and entirely to much explanation and whining. This is not why I have been reading these books. I will now be taking a break from reading the Retrieval Artist series for awhile, it looks like the next book in the series may have more action and less politics so I will eventually listen to/read it, but it wont be anytime soon. 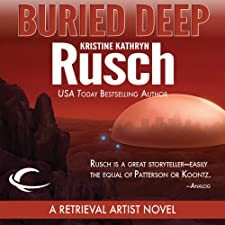 Forensic anthropologist Aisha Costard has been summoned to Mars to examine skeletal remains recently discovered beneath a building erected by the Disty aliens. The bones belong to a human woman who vanished 30 years ago with her children. She is believed to have been one of the Disappeared, outlaws wanted for crimes against alien civilizations. To investigate the mystery of the skeleton, Aisha turns to Retrieval Artist Miles Flint. Following the trail back three decades and seeking the whereabouts of the victim’s missing children, Miles discovers a deadly secret that could threaten the stability of the entire solar system. ©2005 White Mist Mountain, Inc.; (P)2008 Audible, Inc. I rate this book a 5 out of 10 and only recommend it to people who are invested in the Retrieval Artist series. This is book 3 in the Retrieval Artist series. I really liked this one. So far it is the best book in the series. The tension between Noelle and Flint continues to grow as they try to sort out how they feel about each other. I liked the mystery aspect and the depth in which it was explored by Flint. His honor and ability to sleep at night are seriously on the line. It is this aspect that made the story interesting to me, I could use a lot more of that type of story. Action, conflict, mystery and more action. The politics in this book did get on my nerves; I could do without all the back and forth about alien politics. Officer Noelle DeRicci is investigating a murder in Armstrong, the domed colony on the Moon. 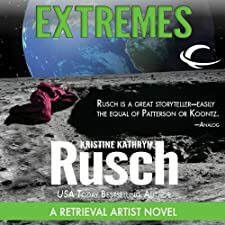 The victim was one of the Disappeared – outlaws in hiding who are wanted for crimes against alien civilizations – whose family had her brought home, believing she was no longer in danger. Retrieval Artist Miles Flint is responsible for putting the dead woman in harm’s way. He may be the only one with the information needed to solve the case. 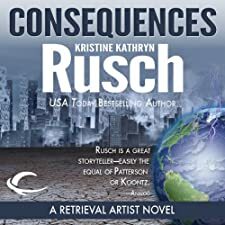 Now, with DeRicci pressing him for answers he’s not ready to give, he must relive the events that led up to his client’s death, including her role in a war between humans and a mysterious alien race. And that ongoing war continues to escalate, threatening to consume the entire solar system. ©2004 White Mist Mountain, Inc.; (P)2008 Audible, Inc. I rate this book a 9 out of 10 and recommend it to anyone who is reading the Retrieval Artist series. This is the second book in the Retrieval Artist series of books and is a great continuation of the storyline. In this book Flint and Noelle are no longer working together and Flint is learning that he really can’t trust anyone, which is very hard for him as he really wants to trust Noelle with everything he knows, but telling her to much will endanger his clients and their families. The tension between Noelle and Flint is growing; they are trying to figure out what there new relationship is and how it will work in the future. It is not something that will be resolved anytime soon. It is this tension between the characters along with the crime-mystery drama that makes these books enjoyable for me. Jay Snyder continues doing a great job bringing the characters to life. His name: Miles Flint. His occupation: Retrieval Artist. His job: find the Disappeared – outlaws on the run, wanted for crimes against alien cultures. The catch: Flint isn’t working on the side of the law anymore. One simple mistake and a Disappeared could end up dead. But this time, the death of an ailing Retrieval Artist has caught Flint’s attention. He suspects it was foul play, not a viral infection. Equally suspicious is a young woman’s sudden demise during the Moon’s prestigious Extreme Marathon. As Flint investigates, he finds an ominous connection. 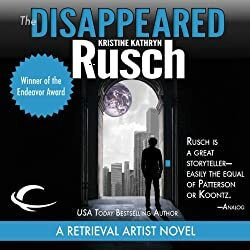 Both deaths lead back to a scientist – a scientist who is now one of the Disappeared. ©2003 White Mist Mountain, Inc.; (P)2008 Audible, Inc. I rate this book an 8 out of 10 and recommend it to anyone who enjoys sci-fi crime drama stories. I chose this book based upon the reviews at Audible and they were right, it is a very good listen. Jay Snyder turns in a very good performance bringing the characters to life and giving each one a uniqueness that makes them come alive. This is the first book in a series that is currently up to 9 books, there is a lot of good reading here and it is a nice step away from the John Scalzi books I have been listening to. What I like most about this book is how clear the main characters motives are, they are driven by things that make sense to me, their emotions feel real and easy to understand. They are very human. In this universe Human’s have agreed to respect and uphold the laws of many different alien cultures. This has created a lot of problems for the police and the court systems because many of the alien laws, punishable in amazingly horrible ways, are not obvious to the humans who regularly break those laws accidentally by doing things that are not considered illegal by the humans. Those that find themselves in trouble disappear; they change their identities and their lives to escape the alien punishments that await them. They spend the rest of their lives on the run from both the human and alien courts. There are bounty hunters known as "Trackers" who hunt down the disappeared to bring them back to the courts while "Retrieval Artists" who search for the disappeared to help them in different ways. Retrieval Artists help the lost find their way back home, whether they like it or not. Specialized private detectives, they investigate the most unusual crimes in the galaxy. But Miles Flint isn’t a Retrieval Artist. He’s just a cop, trying to do his job. In a stolen space yacht, three people have been found eviscerated, the grisly signature of an alien vengeance killing. Moments later, the border patrol halts another ship launched out of the moon’s orbit. Its passengers are two human children, kidnapped by the most ruthless aliens in the universe. Both ships are linked to a woman on the run: a Disappeared relocated to the inhospitable landscape of Mars. A reluctant outlaw with a bounty on her head and a detective on her case, she’s about to teach all of them a lesson: it’s dangerous to gamble with your life in a universe that rigs the game. ©2002 White Mist Mountain, Inc.; (P)2008 Audible, Inc. I rate this book an 8 out of 10 and recommend to anyone who likes mystery, detective and sci-fi novels. I bought this used hardcover book from The Book Nook II in Marietta. After reading "A Dirty Job" also be Christopher Moore I was determined to read more of his stories, so I bought 2 of them as used hardcovers. 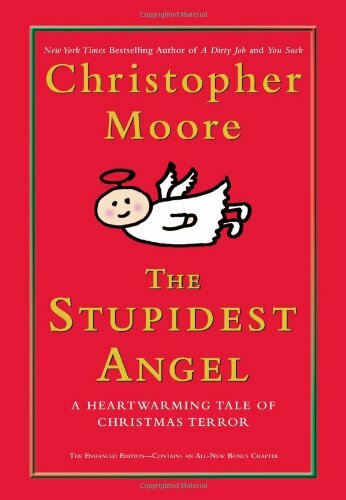 The Stupidest Angel was a very quick read, it only took me two nights of reading to finish it and I enjoyed every minute. It is a fun romp through a small town where everyone is in everyone’s business. This book makes me want to read more of Moore’s work and I already have a second hardback just waiting to be read. ‘Twas the night (okay, more like the week) before Christmas, and all through the tiny community of Pine Cove, California, people are busy buying, wrapping, packing, and generally getting into the holiday spirit. But not everybody is feeling the joy. Little Joshua Barker is in desperate need of a holiday miracle. No, he’s not on his deathbed; no, his dog hasn’t run away from home. But Josh is sure that he saw Santa take a shovel to the head, and now the seven-year-old has only one prayer: Please, Santa, come back from the dead. Move over, Charles Dickens — it’s Christopher Moore time. I rate this book an 8 out of 10. It is a fun quick read.